New York City is already a hub for digital media, advertising, and all manner of tech startups. So it’s not all that surprising that last week, the city announced that a property that formerly housed a consumer electronics and appliance mecca, PC Richards & Sons on 14th Street in Union Square, will become the site of a new tech center. The projected development cost for Civic Hall is $250 million and the funds will come from RAL Development Services, the project's developer. The city is providing land for the project which will break ground in 2018 and open in 2020. What’s a bit different about this announcement is that it will be anchored by Civic Hall, a collaborative work and event space for startups, and will house a digital training center. It will also create 600 new jobs, according to New York City’s Economic Development Corp. (EDC). There’s a great lineup of partners in Civic Hall, including the New York City Foundation for Computer Science Education, General Assembly, Per Scholas, FedCap, Code to Work, and Coalition for Queens. Partners in the project have said they’ll offer discounted training to remove barriers to tech education. The announcement about the new tech hub was made at the offices of AppNexus, the ad tech firm that plans to go public. The site is expected to attract a wider audience for programmed events that are supported by a diverse network of technologists, "makers" and social media entrepreneurs. In his recent State of the City address, New York City Mayor Bill de Blasio made a commitment to creating 100,000 “good-paying jobs” (this is relative, of course, given the cost of living in the NYC metro area) within the next decade--40,000 of those jobs are anticipated within the next four years. 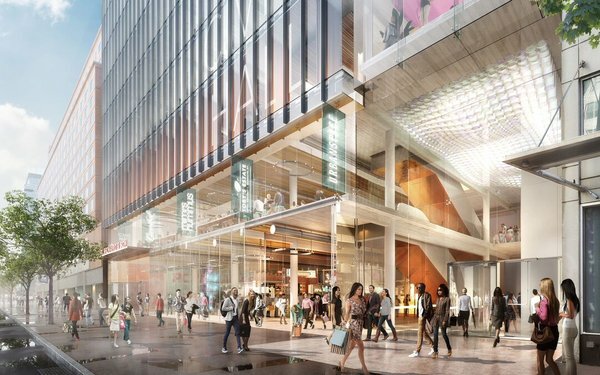 “This new hub will be the front-door for tech in New York City. People searching for jobs, training or the resources to start a company will have a place to come to connect and get support. No other city in the nation has anything like it. It represents this City’s commitment to a strong and inclusive tech ecosystem,” de Blasio stated. There was plenty of excitement about the project. “Look out Silicon Valley, here comes Silicon Alley, supported by a city government that is providing the funding, space, and data the tech sector needs to thrive,” stated New York City Council Member Ben Kallos. The 258,000 square-foot project, 36,500 square feet of which will house the tech training center, is also expected to create more than 800 construction jobs. The project will be union-built and staffed, and in compliance with HireNYC guidelines, according to the EDC. Tech companies based in the city have received $4.6 billion in venture capital funding in 2014, up from $2.4 billion in 2011—a 91% increase that has contributed to the growth of the city’s $125 billion technology economy, according to the EDC. And since launching in 2009, the city’s incubator network has provided over 170,000 square feet of affordable real estate to approximately 1,000 startup businesses. Those firms have raised more than $180 million in venture funding.